Koh Rong is a tiny island off Cambodia's south coast – 15km of pristine jungle and pale sand so soft it feels like icing sugar between your toes. A few hundred people live here, their corrugated huts lining the beach on the island's eastern edge. Their children attend a local school. They fish. And they provide food and drink for the small groups of scuba divers who explore Koh Rong's emerald waters. Until recently, few tourists visited this beach. But in the past couple of months, a handful of wood and thatch bungalows have appeared among the trees. And if you keep walking, round a tiny headland, you reach few more, including a magnificent treehouse, two storeys high with vertiginous steps, waves lapping at its feet and heart-stopping views out to sea. 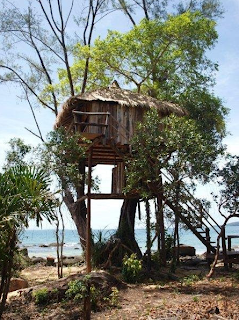 The treehouse was built by Nuch Ros, a beautiful, bubbly girl from Sihanoukville across the water, and her Turkish husband, Bora Ozturk (she fed us hot sour soup to revive me after the bumpy crossing). It has a large bed with a mosquito net, open sides to catch the breeze, even a shower. We threw down our packs and dozed to escape the searing midday sun. A word on that: it is a hardier traveller than I, I have discovered, who braves Cambodia on the cusp of the rainy season. Most days it reaches 40 degrees, and it is so humid that I swear I sweat even in the shower. I am always, always hot. A fan is a must, air-conditioning preferable, otherwise sleep (in the loosest sense) involves lying in one position long enough for the sheet to soak, before rolling onto a drier patch and repeating. The rains are on their way, though. Most evenings, thunder rumbles like timpani and lightening forks through the clouds, sometimes followed by a short downpour that cools the air momentarily. But that night in the treehouse, there is no relief. We are sweating and fanless (the generator is turned off at 9pm). We watch three storms over the mainland, praying for them to reach us, but instead, the air is as thick as noodle soup and the surf beneath us turns listlessly. Sleep is impossible. Suddenly, a light breeze blows across me. It is almost imperceptible, but I sit up nonetheless to feel its effect on my body. It slowly picks up, and soon my wet skin is drying, the mosquito net is billowing gently and the mercury is falling. I am pathetically grateful. It doesn't take long to stiffen and minutes later, an empty water bottle blows off the window ledge and lands with a clatter on the floor. Suddenly, lightening fills the entire room, thunder rumbles angrily and the rain comes down. We're now wide awake. The mosquito net has come loose completely, but I tuck it back under the mattress. It's a pointless exercise as it is whipping around us like a main sail in a gale. A towel and a bikini, tied securely to the balcony, are whisked away into the night. Rain is slicing through the open windows, and the sea is roaring beneath us. Thunder claps deafeningly directly above our heads. I point out that the treehouse, barely two months old, hasn't yet weathered a rainy season. And suddenly we are laughing uncontrollably, tears streaming down our faces, hysterical with relief, excitement and fear that our treehouse is going to collapse into a heap of sticks. The storm continues at this intensity for over half an hour. We've stopped laughing, we're cold and wet and we just want it to end. Finally, after a few false alarms, the wind subsides, the mosquito net hangs loose again and I fall into a deep, cool, exhausted sleep.